Newsstand is Apple’s online magazine application. Basically, it’s the place you go to view digital content – and Apple displays the Newsstand icon by default on all its devices (Iphone and Ipad). I took a peek in Newsstand last year and couldn’t believe that there were only 5 golf magazines for the entire big bad world. Considering the amount of people with Ipads, it’s a fair assumption that many of these people will like reading golf content on their device. So the idea to bring a golf magazine into this world was born. But then a change. On the long drive from Melbourne to Queensland the idea started to stir in me again – I thought it’s a massive opportunity to get in early, and introduce many more golfers to the concept of natural learning. I’m good at producing content and have so much already, that it wasn’t going to be too hard to repackage it in a magazine. The tipping point came when I discovered a new software that promised to make magazine publishing a snack – I ordered the package and got busy while Clare and I spent a quiet week at a B&B (Clare was heavily pregnant and wasn’t too interest in sightseeing – a perfect leave pass). Despite the promise of “easy”, it has been a huge learning curve – my little brain has been pushed and prodded in all sorts of uncomfortable ways and I even had to overcome the frustration of having my first attempt rejected by Apple. 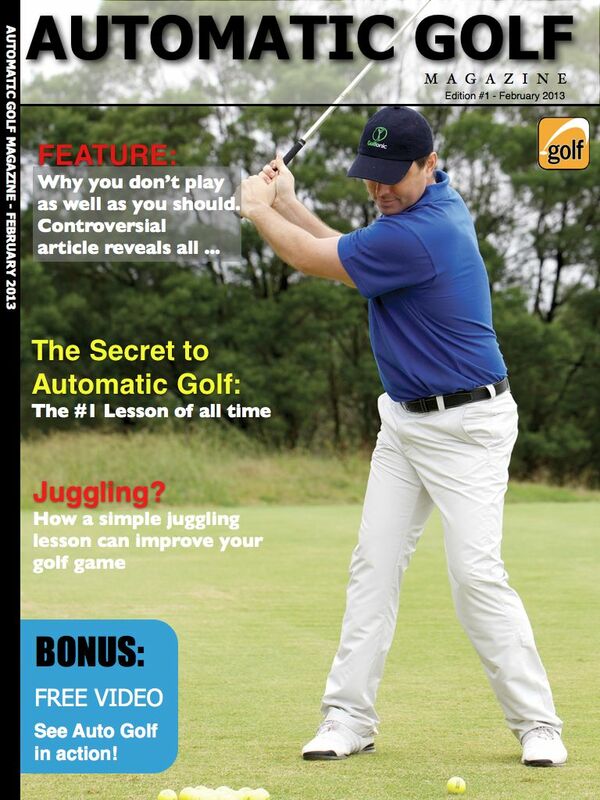 But I have made it and I’m pleased to announce that the first edition of Automatic Golf Magazine is available. The App and magazine editions are all FREE. Zip, zilch, nada. So there’s no excuse to not check it out. I’m hoping to publish an edition each month. To make my life easier and give me some inspiration, I’d love to hear your ideas on what you’d like to see. The more feedback I receive the better the content I should be able to produce. The magazine is on the Apple network only and has been produced for the Ipad range (much easier to read on the Ipad then an Iphone). This is 100% digital and is not available in any sort of hardcopy. My goal is to introduce more golfers to the concepts discussed here and hopefully drive our little community. One last thing: If you find any major bugs or faults please let me know. Oh, and another thing, if you could leave a review that would be awesome! Thank-you Rooster. How is the cricket going? Great idea, look forward to it. As a subject – how to stop topping fairway woods. I hope you enjoy it Tom – the first issue is ready to go. Great work Cam! Top reading during this wet weather! Thanks Michael – I’m working on some new issues so keep your eyes peeled. If you get a second, leave a review with Apple so more people will get the chance to see it. Thanks mate, appreciate your comments.